Newt Gingrich caused a certain amount of controversy when he said that the Palestinians were an “invented” nationality. That should come as no surprise. The boy who notices that the Emperor has no clothes should expect to be the center of controversy. Some of Gingrich’s critics however have observed that any nationality is to a greater or lesser extent invented, in that nationality is more of a subjective feeling than an objective fact. Take, for example America. Before 1776 nearly all of the English-speaking people in the thirteen British colonies thought of themselves as English. By 1790, these same people thought of themselves as Americans. They have a point and with that in mind I’ll concede that Palestinian nationality, thought of recent origin, is a legitimate aspiration. The argument that generally follows is that if there is a Palestinian nation, then there should be a Palestinian state, on land yielded by Israel. I’ll concede that point to. I have a question though. If the Palestinians deserve a state, why don’t the Kurds? They would seem to deserve their own state far more than the Palestinians. 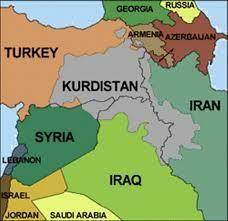 The Kurds live in an area divided by Turkey and Iraq, with a strip of land in Iran. They have lived in this region since at least the time of Alexander the Great and probably long before. They speak their own language, and have their own culture distinct from their neighbors. In Iraq, under the Baathist regime, the Kurds were badly persecuted. During the Iran-Iraq war, Saddam Hussein massacred at least 50,000 Kurds for suspected sympathy for Iran. After the First Gulf War, the Kurds rebelled again and Saddam again suppressed them with only the UN no-fly zone preventing another massacre. 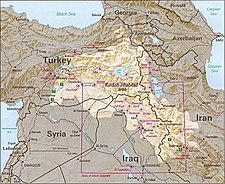 After the fall of Saddam, the Kurds established an autonomous region of Northern Iraq which remains to this day. They have generally adapted better than the other peoples of Iraq to the post-Saddam order, but they have had problems with Turkey and economic and political difficulties. In Turkey, the Kurds are still being persecuted. After the fall of the Ottoman Empire, the policy of the new Republic of Turkey was to promote Turkish nationalism by suppressing any minority populations in Turkey. The Greeks population was expelled and Kurdish ethnicity denied. The Kurds were declared to be “Mountain or Eastern Turks” and their language and culture outlawed. Only in 1991 was Kurdish permitted to be spoken in public. Turkish persecuted of the Kurds has relaxed somewhat in recent years, as Turkey has applied to join the EU, but the Kurds are still badly discriminated against. So, where is the international outcry over the treatment of the Kurds in Turkey and Iran? Where are the UN resolutions against Turkey, the accusations of Turkish genocide? Why were there no effective efforts to stop Saddam’s acts of genocide? Where are the calls for a Kurdish state? Where are the flotillas bringing “aid” to the oppressed Kurds? Do I even have to ask? The truth is, and here is where I am shouting that the Emperor has no clothes, all of the people who express such sympathy for the Palestinian cause care no more about the Palestinians than they do about the Kurds, or anyone else. If they did, they would be encouraging the Palestinians to come to terms with Israel instead of urging them to fight. They would be trying to build up some sort of infrastructure in the Palestinian territories, so that if they ever did get their own state, it would not immediately join the ranks of failed states. The simple truth is that no one cares about the Palestinians as people, they just want a stick to beat Israel with.